If you want to know how to pluck your eyebrows, then you’ve come to the right place. Right from all the materials you need to the precautions you need to take, everything will be discussed in this article. If you’re a first timer, then this is article is pretty much what you’ll all need. Alright, so enough of blowing our own trumpet and on with the article! To pluck your eyebrows, you have to keep a few things with you beforehand. All of these products can easily be found lying around your house. Always opt for a sharp, slanted style. They are able to grab smaller hairs easily which cannot be plucked by their pointy versions. Or even a pair of small scissors will do just fine. You can trim your hairs before or after plucking your eyebrows – whatever suits you. Or brow pomade or even eyeshadow. This will come in handy after you’re done with your plucking and need to perfect your shape. Make sure that it’s the same color as your eyebrow hair or even a shade lighter. Anything darker will make your eyebrow filling stand out. Comb your hair in shape, as well making excessively long hair stand out which you can trim later on. Use them after you’re done with your plucking to reduce any puffiness or redness on your skin. Apply it 5 minutes before your plucking. This softens your skin and makes it easier to pull out your hairs from the roots with much lesser pain. Now that we’re done with the items you need to prepare beforehand, it's time to get to the really thing about plucking your eyebrows. Stand up in front of the mirror and position yourself comfortably. You can sit or stand as per your convenience. Take the spoolie and brush your hair upwards. All the extra hair that’s standing out can be cut using your scissors. Now brush the hair downwards, and then trim all the excessive hair from there. Apply and let it get absorbed completely by your skin for 5-10 minutes, depending on your skin type and the type of cream you’re using. Draw out (with very light gestures) the shape that you want after your plucking. This will help you not to pluck out too little or too much from your eyebrows, a mistake very common among first timers. Don’t go in too thin. Remember – fuller hair can always be plucked out later but thinner eyebrows cannot be made to go back to being fuller – you need to grow your hair for that. Use the pencil to follow the natural shape of your eyebrow and stay as faithful to it as you can. Start below the widest part of your brows and end where your eyebrow ends. Remember to keep a space of at least a quarter of an inch between your two brows. The shape of your brows can make or break your appearance so make sure you do a little research before narrowing down on a shape that you desire. For example, if you have a long face, brows with no arches make your face smaller and shorter. If you have a round face, then thicker brows will take the attention away from your face’s round shape. Mature women should always opt for thicker eyebrows irrespective of their face shape because thinner eyebrows instantly make them look a decade older. There are several types of arches you can choose from, and it’s always best to go for an arch that will complement the shape of your face. Once you’ve narrowed down on your choice, mark the points on both your brows with your brow pencil. And remember to make sure both are symmetrical. If you don’t know where your eyebrows should end, well, place your pencil on the tip of your nose, tilt it at 45-degree angle, and mark that spot on your skin. This is where, ideally, your brow should end. Repeat the same process on the other side. Just make sure you’re tweezing outside the line that you’ve created with your brow pencil. Pluck, pluck, pluck! 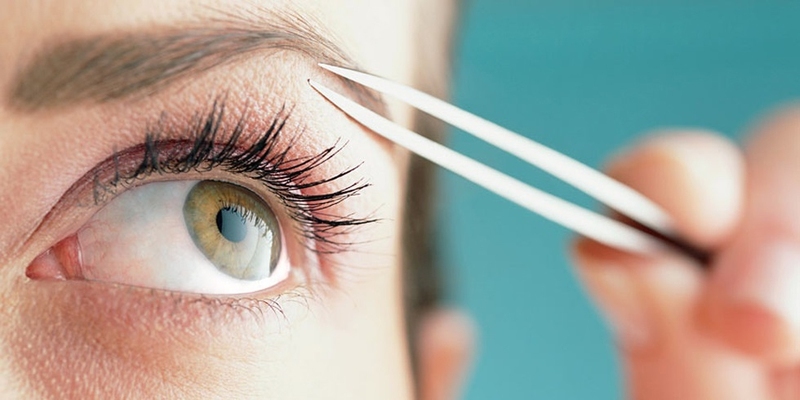 Now that you know how to pluck your eyebrows with tweezers, it’s time to know some great tips and tricks. If you’ve been plucking your brows for a while, you may already know about them but if you’re a first timer, these sure are gonna make your plucking time a lot easier. The thing is that magnifying mirrors give you such a close up of your brows that they make it appear as if you have more hair to pluck than you actually do. So always remember to use a normal mirror. After every 4-5 tweezes, step back and look at your brows. This will help give you a better view of how they would look under normal circumstances i.e. from the point of view of other people. Whenever possible, always tweeze under good lighting. That helps you see hair that would have otherwise been missed by you. This is the very last tip on how to pluck your eyebrows. If applying a cream is not something up your alley or if you’re too lazy, then tweeze your brows after your step out of a hot shower. Your hair follicles are soft during this time, which means you will be able to easily pluck them with very little to no pain.